05: How are DRIVE MAPS and UNC paths supported in PolicyPak Least Privilege Manager? First, let’s start with UNC paths. UNC Paths are supported and honored. Note that the same UNC target could have different names, for instance\\fabrikam\share,\\fabrikam.com\shareor\\192.168.2.10\sharemight all point the exact same place. Each rule name is evaluated differently. You would need a rule for\\192.168.2.10\share…. You don’t need to make any explicit “Drive map” rules. So, don’t elevate “S:” in PolicyPakLeast Privilege Manager. That is incorrect syntax. Instead, you would make a UNC path rule for what S: is really pointing to. You don’t need to have a PolicyPak Least Privilege Manager rule to “Elevate S:”. 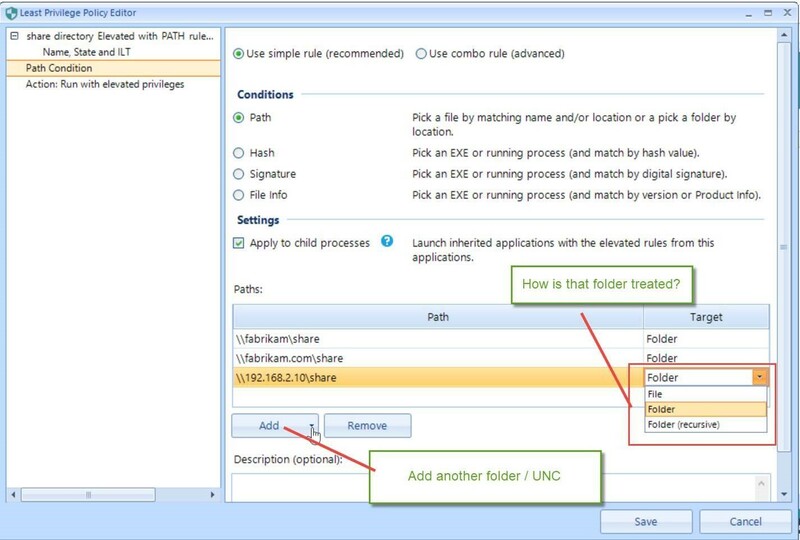 You DO need to have a PolicyPak Least Privilege Manager rule to “Elevate\\fabrikam.com\share” and select Folder or Folder (Recursive) as shown here. 01: What log can help me determine why an application (MSI, etc.) was ALLOWED, ELEVATED or BLOCKED? 02: Why doesn’t PolicyPak Least Privilege Manager work Windows 7 + SHA256 signed.JS and .VBS files ? 03: I want all the files in a folder to be ALLOWED when SecureRun is used. What is the correct syntax? 04: If multiple PolicyPak Least Privilege Manager rules would apply, which rule takes precedence?